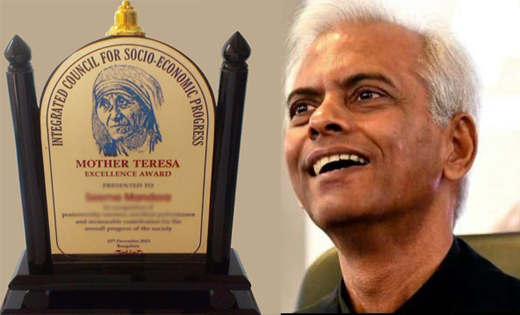 Mumbai, Oct 03, 2017: Mumbai-based foundation that promotes communal harmony in India has chosen Rev Fr Tom Uzhunnalil, the recently released captive from Yemen, for its Mother Teresa Memorial Award for Social Justice. The 59-year-old Salesian priest “has been an inspiring example of being a compassionate human being and for continuing to work at the old-age home of Missionaries of Charity in Yemen, in spite of being given an option to leave the country,” said Abraham Mathai, president of the, Harmony Foundation and former vice-chairperson of Maharashtra Minorities Commission. The awards were instituted in 2005. The award ceremony this year is scheduled for December 10 with Vice President Venkaiah Naidu expected to be the chief guest. “We commend [Father] Tom’s dedication and commitment towards working in a place of great danger where his colleagues were murdered in cold blood,” Mathai said. It may be recalled that Rev.Uzhunnalil was abducted on March 4, 2016, when terrorists barged into the care home for the elderly set up by Mother Teresa’s Missionaries of Charity in Aden, Yemen. They shot dead 16 people, including four nuns, who worked in the center. One of the nuns was from Jharkhand, eastern India. Rev Uzhunnalil was rescued from captivity from an undisclosed location in Yemen thanks to the intervention of the Sultanate of Oman with the India govt that helped to find and rescue him. Each year, individuals or organizations receive the harmony award for exceptional service to humanity. The past recipients included global leaders and icons such as Nobel Laureates Malala Yousafzai and the Dalai Lama, current Ghanian President Nana Akufo-Addo, former Prime Minister of Malaysia Mahathir Mohammad, former Deputy Speaker of the House of Lords, UK, Baroness Caroline Cox and aid groups such as Medecines Sans Frontieres, the largest medical Organisation worldwide and White Helmets, which is currently providing aid to war-ravaged Syria. “Our Foundation’s theme for the year 2017 is Compassion Beyond Borders — a compassionate response to the refugee crisis. We endeavor to create awareness and action in the international community,” Mathai stated. .